Karen’s more in touch with her spiritual self than me, and a tour of the Golden Triangle has been on her bucket list, and in my ear for a decade. My greatest fear was that everything you eat would try to kill me, and I wasn’t expecting a life affirming experience… how wrong can a man be! I wouldn’t have believed if you told me this tour would open my eyes to a whole new culinary pinnacle of deliciousness. This is a man who doesn’t do curry or chillies. But this may be Indian food Jim, but not as we know it! Words fail to describe the amazing foodie experience for which in itself I would recommend you taste a voyage across India. 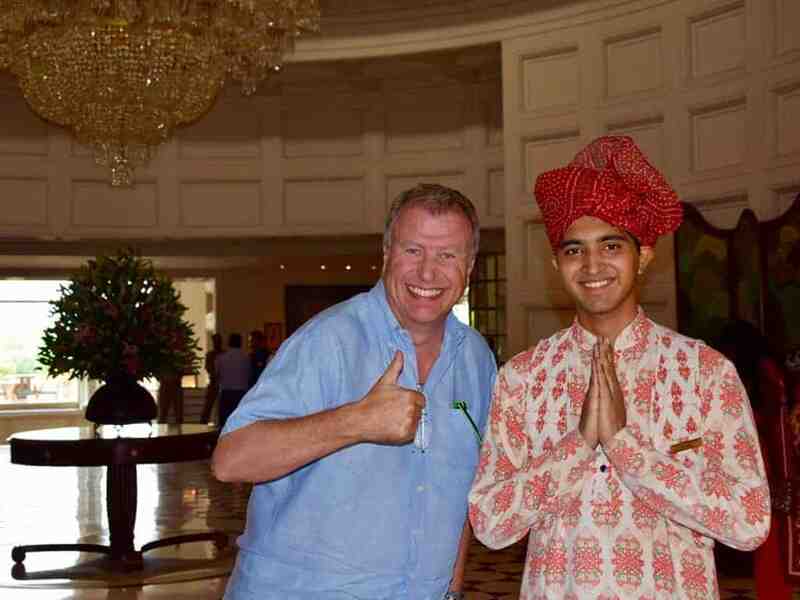 We landed in colonial New Delhi at the Imperial Hotel. Swathed in old English loveliness and polo, and croquet, and afternoon tea. The scale of this palatial residence and impeccable unstuffy service relieves one of breath. 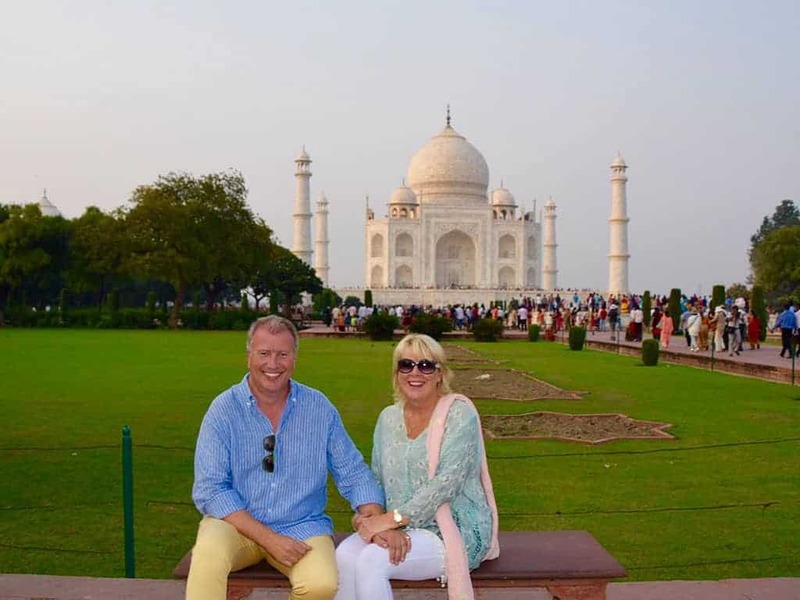 Our tour organised by Western & Oriental over 12 days took in the Golden Triangle of Delhi, Varanasi, Agra, Jaipur and Jodhpur, then back to Delhi. Each stop-off for 2 nights merely proved a taster for a country now to be revisited. A tour guide accompanied us every step of the way. Don’t hesitate! This proved the best way to remove any potential for stress and guarantee the personalised trip we craved. 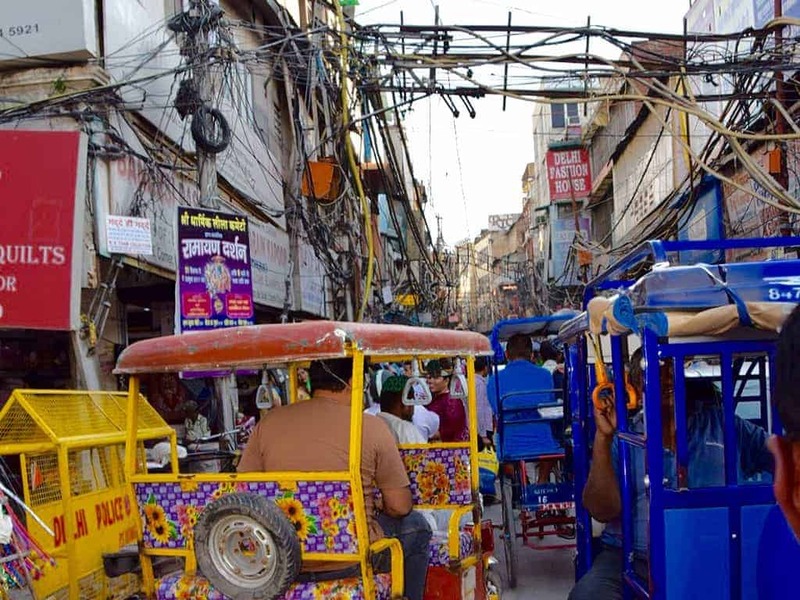 Daily temperatures around 36c with low humidity lends ample comfort when riding rickshaws beneath a canopy of barewires through the back streets of Delhi. The cacophony of sound and colour in the ancient city of Varanasi assaults the senses with a heady mix of incense spice and chaos. 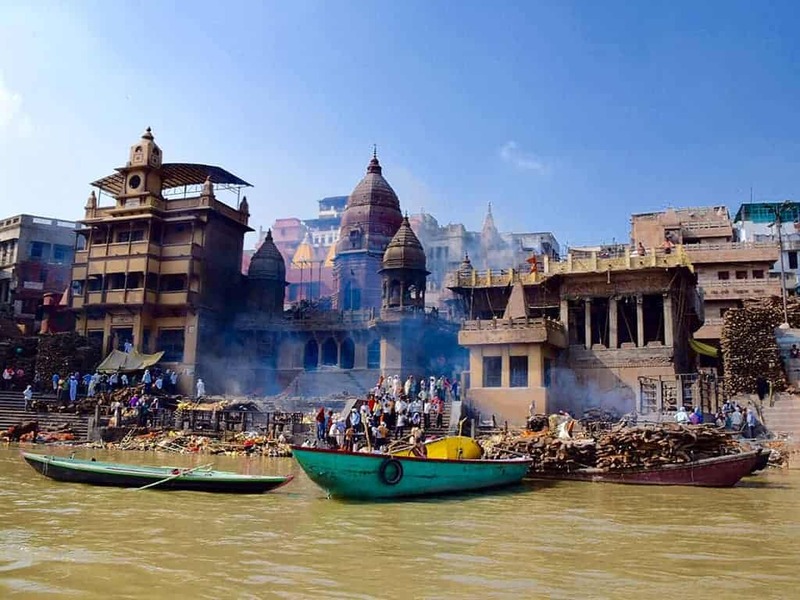 Varanasi is the spiritual centre of the Hindu faith where we witnessed religious ceremonies purging one’s sins in the River Ganges. No doubt great for the soul but all of life’s in that water so I wouldn’t recommend drinking it. A short flight to Agra on domestic airline Jet Airways with brand new aircraft and charming service was only challenged for her ladyship with a 15kg baggage limit. All you need is a couple of linen shirts and a toothbrush, and her ladyship is now a master at skinny-packing silk blouses. 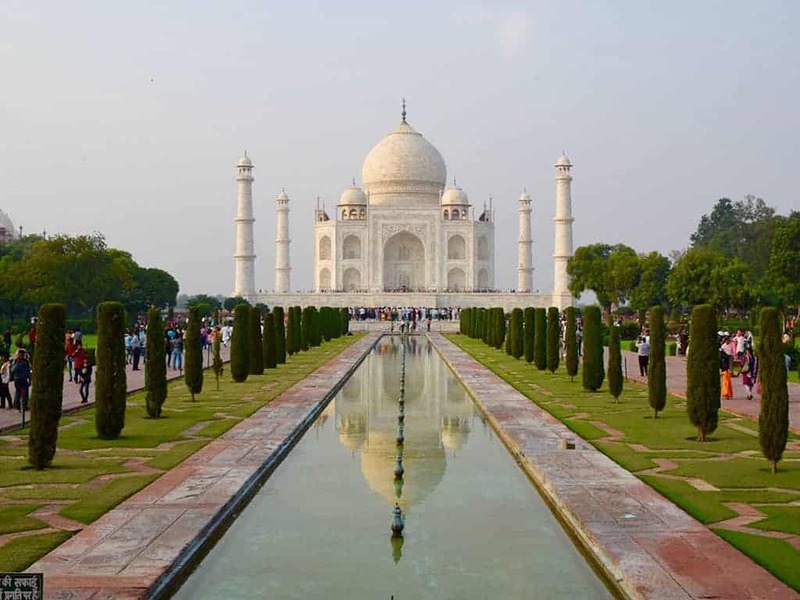 My first exposure to the Taj Mahal was the opening of our balcony doors at the exquisite Oberoi Amar Vilas to the sight of this incredible mausoleum honed of marble. Do see it both at sunrise and sunset if given the opportunity. 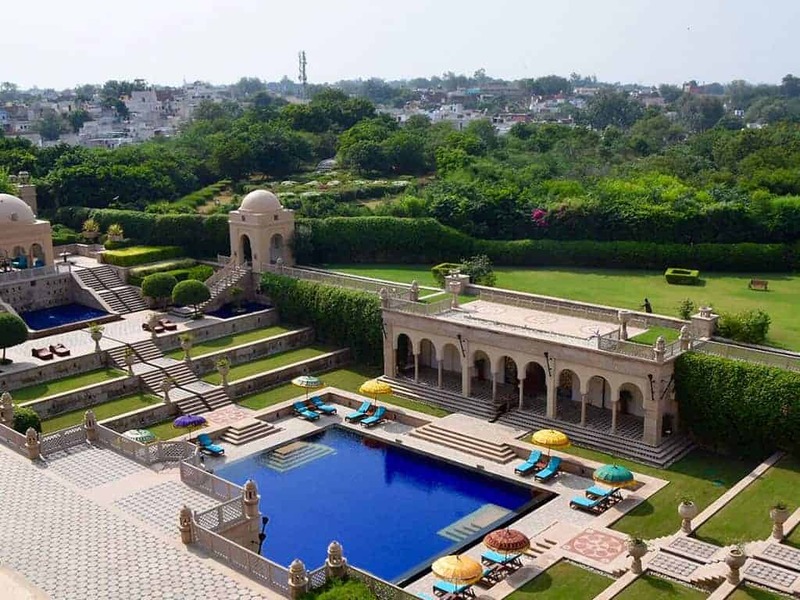 Fully rested from the Oberoi’s exquisite cascading pools the ‘Lovely booked us to drive the 6 hours from Agra to Jaipur. Most people would skip seeing the back country for the sake of more palaces and religious monuments but I’ve been happily enlightened with the realisation that India is a beautiful country with incredible warmth of personality steeped in wealth wholly unrelated to material possession. This is reinforced by a ‘no tipping’ policy in nearly all the hotels we visited; A relief to experience such impeccable service more telling of the populous nature than the dollar rate. Sightseeing in Jaipur embraced the Red Fort, a floating palace, local spice and textile markets and rich silk weaving. Walk the streets and sense the flavours of this glorious place; you cross the road with your ears not your eyes. Like a river of cars bicycles trucks rickshaws people cows (yes loose cows!) scooters, and the odd goat all free-flow in any direction. One gently traverses at a steady pace with minimum hesitancy to blend in through the chaos that breathes past you. Yet, pulling into an oncoming dual carriage way from a roadside rest, head on, still lives with me. 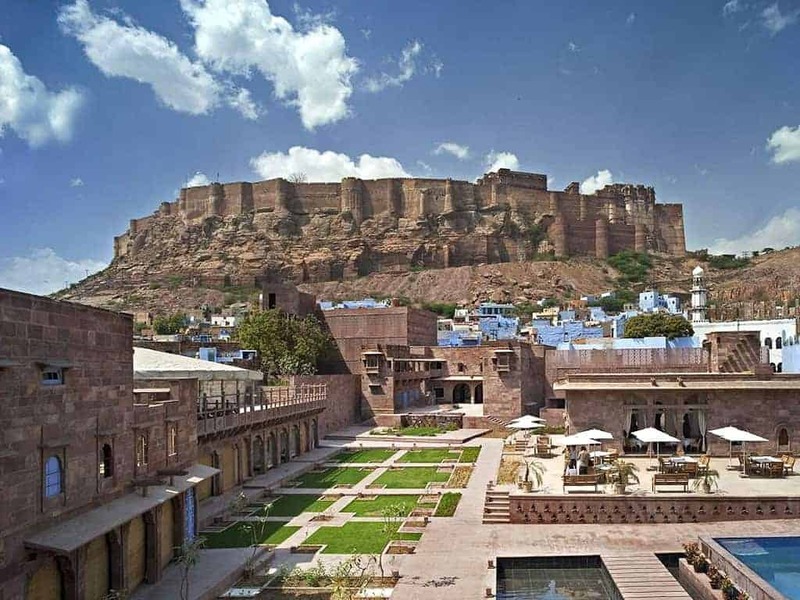 In Jodhpur, The Raas Hotel is a spectacular walled enclave in the centre of mayhem. Imagine a medieval city with abundant step wells deep into the earth and narrow streets draped with an embarrassment of colour round every corner. Life’s changed around here. The children of beggars are no longer maimed for profit, those days are long gone. Every child receives an education and everyone is entitled to a free meal provided every day on the street. The infrastructure of this massive country is receiving a whole new momentum of focused investment at a pace suited to both culture as much as commerce. Breakfast on the terrace in the walled gardens listening to the orchestra of life from beyond the walls lends a texture to India like no other. So to say we dropped into quintessential India in this blue painted City is an understatement. I still may not be such the spiritual being, but I have to admit to being enchanted by India’s raw intoxicating spirit. By James Beagrie, MD, Meon Valley Travel. View more photos of our unforgettable trip on our Facebook Page or call us on 01730 711010 for information on any of our India tours.